Some things were just meant for converting from main dish to a salad. 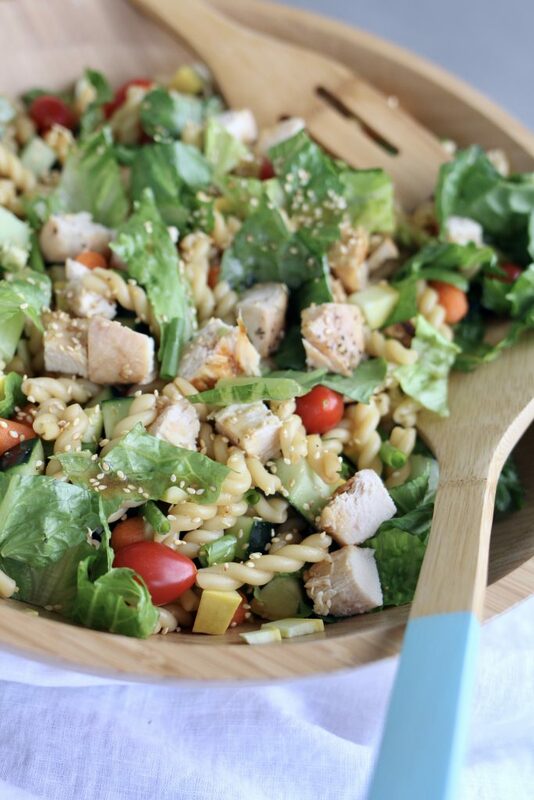 Teriyaki chicken, veggies and pasta are three items that combine perfectly to make a Teriyaki Chicken and Vegetable Pasta Salad. This salad is easy, travels well and is always a hit at gatherings! Teriyaki Chicken and Vegetable Pasta Salad was first given to me years ago from a good friend, Eden Bennett. Eden is an amazing cook and generous about sharing her talents. If you’re looking for a dessert to go with this salad, take a look at her Giant Oatmeal Chocolate Chip Cookies. They are legendary- huge cookies with big chucks of chocolate…so good. But first, the salad! 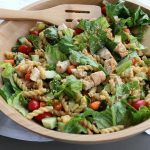 I modified Eden’s Teriyaki Chicken and Vegetable Pasta Salad recipe a bit- I use tomatoes, carrots and cucumber for vegetables, but substitute other fresh veggies as they are available in the summer. Sugar Snap peas are a favorite, but when they are $5 a pound, I leave them out or toss in a little blanched broccoli instead! You can add or omit the veggie ingredients depending on your preferences. My mom always made her own teriyaki sauce by combining soy sauce, a little rice wine vinegar (found in the Asian section of grocery) , a little grated fresh ginger and a bit of sugar. In all the years I’ve cooked, I haven’t found a teriyaki sauce in a bottle I love, until I started using “Veri Veri Teriyaki” by Soy Vay. It’s available almost everywhere from Costco to Walmart. Or of course, on Amazon. It’s the perfect sauce for marinating chicken and beef and in this recipe, is used for dressing as well. Most teriyaki sauce is okay to use without diluting, but this brand is extra concentrated. I have used other brands when in a pinch. If you have to substitute when making the dressing- just add less oil and omit the water. This recipe is the ultimate make-ahead and travel salad. It can be made up to 3 days ahead and be ready to go on the day of serving. The key to keeping everything fresh is to separately bag all of the prepped ingredients, and make sure to squeeze all of the air out of bags (without smashing the contents). This salad fits well into a few sandwich and gallon-size Ziplock bags and is easily arranged on a platter or bowl when you’re ready to serve. I love salads that can be made ahead when I have a busy schedule. Instructions for make-ahead and tips for taking this salad on the road are in the notes on the recipe. Chicken and marinade: Marinate the chicken for at least ½ hour in soy sauce and sugar. I like to use a gallon size Ziplock bag. Discard sauce after marinating. After marinating, cook under broiler or on grill for about 8-10 minutes, depending on the thickness of the chicken breast. When cooled, slice chicken into thin strips. Pasta: Cook Pasta, drain. Place Pasta in bowl. Pour about 1/4 cup of the sauce directly on to the pasta while warm. Toss. Veggies: Cut lettuce into bite sized pieces. Place in large bowl. Add remaining vegetables. Shake a lot of fresh ground pepper over the veggies . Dressing: Shake the Very Very Teriyaki really well. Mix about 1/3 cup of sauce with the oil. Whisk together, taste once the oil, water and teriyaki sauce are mixed together. 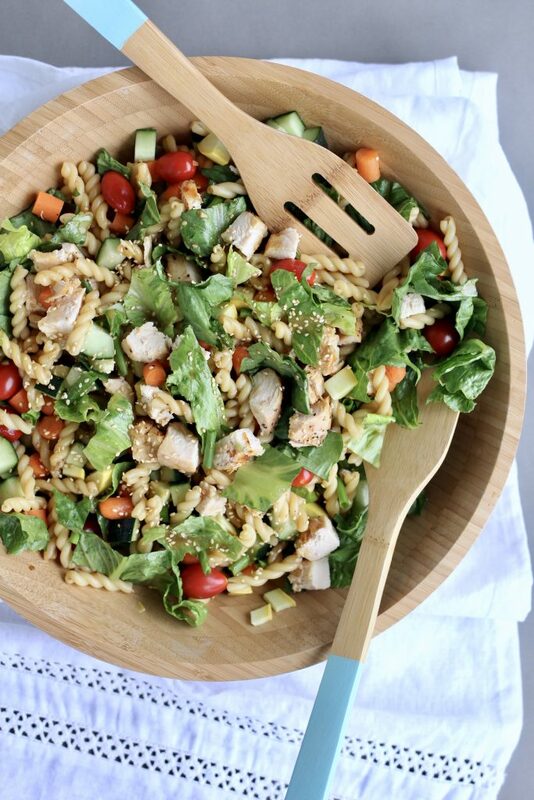 Assembly: Toss all of the Pasta, vegetables, and chicken together in a large bowl. Mix the dressing a little at a time into the salad, generously sprinkle with sesame seeds and more pepper. 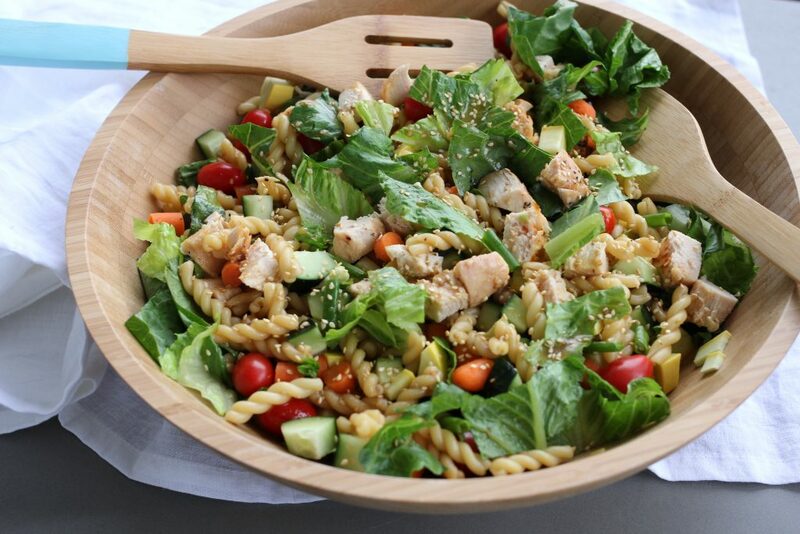 -Teriyaki Pasta Salad can be made with or without the chicken. Cook the pasta, and toss with sauce as directed. Let sit until cool, then pack in a Ziplock bag with all air squeezed out. Cook the chicken, let cool, chop and bag. Chop the carrots and bag. Same with the cucumbers. Leave the grape tomatoes on the counter, tomatoes are best when not refrigerated. Whip up the dressing. It is important to bag all of the ingredients separately to keep fresh. When ready to serve, toss all ingredients together, add chopped lettuce (bagged is fine) grape tomatoes and well shaken dressing, a little at a time. I often don't use all of the dressing. Sprinkle generously with toasted sesame seeds. You can make the salad and place in a bowl for serving and refrigerate several hours before serving. If you are making the salad ahead, use a bagged spinach or romaine that will stand up to a few hours of sitting in a bowl with dressing. Bagged lettuce is dried until there almost no moisture remains in the leaves, which is good and bad. For making salads that have to sit for a while, the greens will not wilt as easily as loose leaf lettuce or spinach. Corrine made this for our girl’s night while the men were all away at the Piresthood Session of General Conference. It was delicious! You can find Very Very Teriyaki Sauce at almost any grocery store now–I buy mine at Maceys or Wal Mart.